In the 1800s, for the first time, scientists began to make real progress in figuring out what the world was made of. Water, it turned out, was made from hydrogen and oxygen. Salt, it turned out, was made from sodium and chlorine. But there were some substances that could not be broken apart… today, we call them elements! The Periodic Table is simply a list of all the types of atoms that make up everything on Earth. Using those same 100+ ingredients, you can make a rock or an airplane or even a human. Understanding the Periodic Table is an essential part of studying chemistry. Today students reviewed how to look at a square on the Periodic Table and turn it into a model of an element. Beryllium (Be), for example, has an atomic number of four. That means that its nucleus is made of four protons — otherwise it wouldn’t be Beryllium — and it also normally has four electrons which orbit the nucleus in distinct shells. 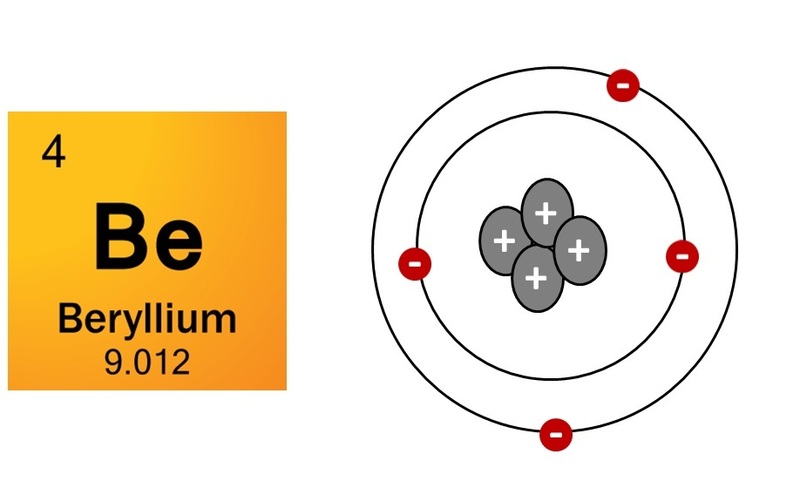 A simplified model of a Beryllium atom would look like the one below. Tomorrow we will add neutrons to the mix, the particle that turned modern chemistry on its head.